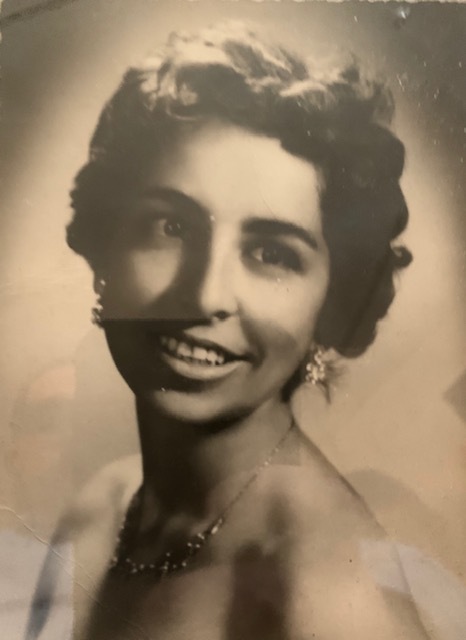 Hildegard Quintanilla a beloved mother, sister, aunt, great aunt passed away peacefully on February 11, 2019 at home. pon meeting Hildegard, you will know that there is no challenge too small or too great for her. By definition, her name, Hildegard, means "battle guard; glorious warfare." And she has certainly lived up to that name. Hildegard has faced - and continues to face - challenges with enormous valor, strength and determination. She is loyal. She is a fighter and protector. When her daughter was diagnosed with breast cancer, Hildegard never left her side. As her daughter was preparing this project, Hildegard, herself, was diagnosed with lung cancer. At the end of August, this year, she went through a successful operation and is having an amazing recovery. We are in awe of her resilience; her ability to handle life’s challenges with poise and grace. Today, we are so grateful that she is cancer free. Hildegard's story - and legacy - began many years ago. Growing up, she spent most of her life as a diplomat. She was born in Berlin, Germany, at a time when her father was a diplomat. Her family returned to Bolivia, where her father was an accomplished and decorated General, politician, and finally, the President of Bolivia. At the age of ten, Hildegard was sent to Argentina to attend the “Esclavas del Sagrado Corazon de Jesus” boarding school. There, she attended school with the sisters of the King of Spain. As a young woman, she was a member of “La Camara Junior Cochabamba Bolivia”, a youth organization dedicated to creating a better world for everyone. She traveled to different countries as a representative of this organization. Hildegard lived in Belgium and returned to Bolivia to become the private secretary to two of the First Ladies of Bolivia. She was then sent to New York City as a diplomat and stayed in New York City where she remained to begin the next chapter of her life. She later worked for Brooke Astor and Estee Lauder. What an honor it is to be here. Friends may call on Wednesday February 13, 2019 from 6-8pm at Clinton Funeral Home, 21 Parrott Street, Cold Spring. A Mass of Christian Burial will be held on Thursday February 14, 2019 at 11am at Our Lady of Loretto, 24 Fair Street Cold Spring. Interment will be private.